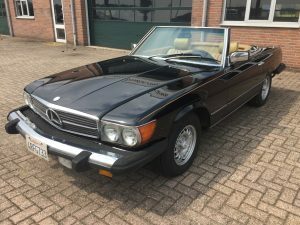 What to pay attention to when buying a Mercedes 450SL, 280SL, 380SL or 560SL? The Mercedes-Benz R107 SL-series is nicknamed 'der Pantzerwagen', the tank. Sticking this label on a sporty open two-seater, at the time the most frivolous thing Das Haus had to offer, is telling for its legendary quality. Especially because the letters SL stand for Sport Light. With an empty weight of more than 1500 kilos and a driving behaviour geared towards comfort, the R107 is more of a grand tourer than a real sports car. Introduced in 1971, the car remained in production until the end of the 80s. With a continuous production time of 18 years this is the second longest produced Mercedes of all time. The undisputed number 1 is the G-Class Geländewagen, which is still on the price lists today. For years, the R107 series was considered to be the unloved child of the Mercedes classic scene. As with so many old prestige class cars, the image of a car is often based on the kinds of people who drive around with it just before the car reaches its lowest point in value. Or rather, the prejudice that sticks to these people. With third generation SL's, these were more often than average moustached men wearing a golden wristwatch, accompanied by a substantial bag of cash and a blonde lady dressed in panther print. Not exactly the types the average god-fearing Mercedes owner wants to associate with. With the passing of time, the R107 SL has fortunately shaken off its moustachian image and the car is now being judged on its merits. One piece of German solidity, wrapped in a chic jacket with a sober elegance. But is the R107 still as indestructible as its legendary image after 40 years? Now that the car has come of age as an emerging classic, we take a closer look at the most popular versions. In recent years, the 450SL has been widely imported from the United States. Americans bought these large eight-cylinder two-seaters in great numbers, despite their substantial new price. In the US, the open Mercedes initially came on the market as 350SL, but the engine was considered to be too light in power. Soon the engine capacity for the American market was increased to 4.5 litres. After a year the type designation was also changed to 450SL. 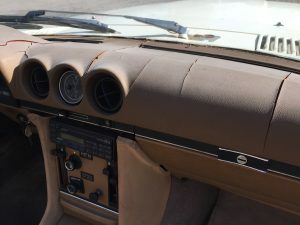 Initially the 350SL could still be ordered with a four-speed manual gearbox, but soon the much more popular automatic transmission became the only available transmission. A V8 SL with manual transmission is very rare and therefore also sought-after by collectors. 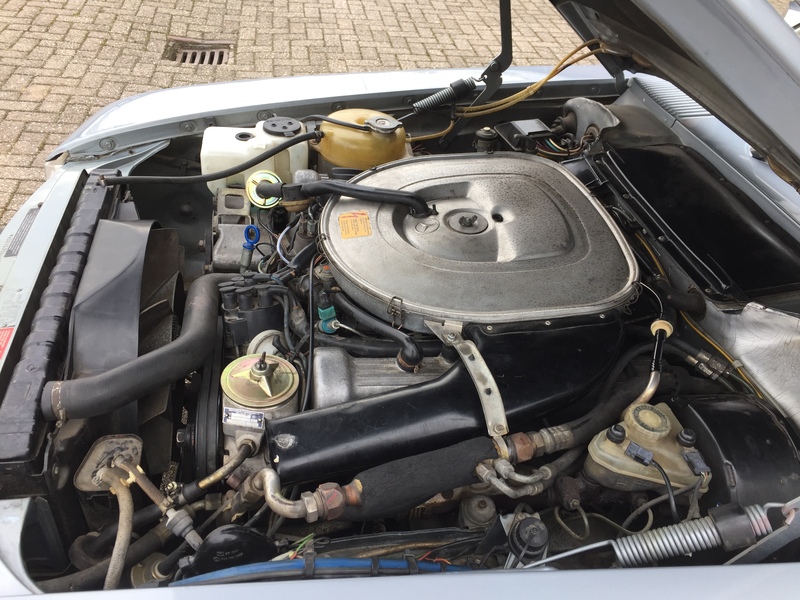 The 450SL V8 engines are wonderfully smooth, credit to their high torque (286 - 325 Nm). The 380SL succeeded the 450SL in 1980. For the American market the power was drastically reduced, to about 155 hp and 260 Nm of torque. This makes it the least powerful of the V8 R107 versions and therefore also the least valuable. However, the build quality and reliability improved considerably compared to the previous SL's. 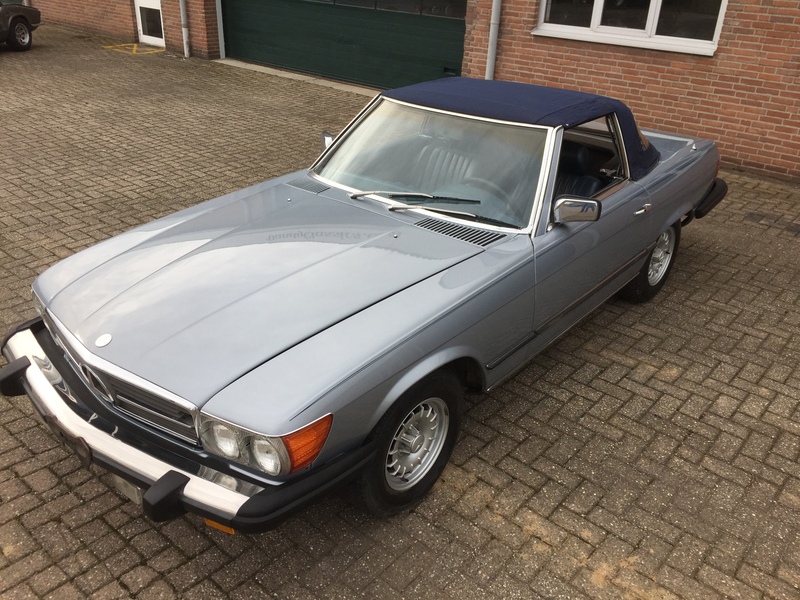 So it will be easier to find a good 380SL. In 1985 the 380 was succeeded by the 420SL, with a slightly larger and stronger engine. Only supplied in the US, Australia and Japan and equipped with a monstrously large 5.6 liter V8. With 227 hp this car is less quick than its displacement suggests. The earliest 450SL's (pre-emission) with 225 hp come very close. The European markets got a slightly smaller top model: the 500SL. With 240 hp and more than 400 Nm of torque, this is the most powerful R107 Mercedes. The R107 SL with 6 cylinder in-line engine. Lighter and more economical than the V8 versions and not so much slower. These versions were especially popular in European markets. Due to grey imports, a few 280SL's ended up in the US. The latest version of the six cylinder is by far the most popular, not in the least because of the legendary type name: 300SL. Mercedesses from these years of construction are generally considered indestructible. The youngest 107's have passed the age of 30 and the first versions are approaching the age of 50. So it is logical that the ravages of time can cause a number of problems, even with well maintained examples. Usually these are common age-related problems: leaking gaskets, oil seals and dried out rubber hoses are common, both at high and low mileage. Vehicles with low mileage (longer periods of inactivity) regularly suffer from a clogged injection system. In the worst case this means that the tank must be cleaned, with replacement of hoses, fuel filter, fuel pump, new or cleaned injectors and a rebuild of the fuel distributor. Problems are manifested by poor starting, irregular idling and incorrect fuel pressure values. Technical wear and tear parts are not overly expensive, although the elimination of a lot of overdue maintenance can be very costly. Although less dramatic than many cars from the 70s and 80s, Mercedes SLs, expecially the early versions, can rust heavily. 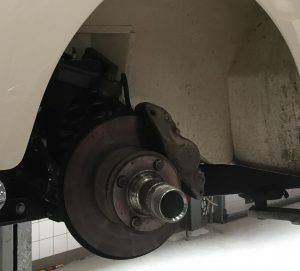 Weak spots are the front fenders above the headlights and on the ribbed underside behind the wheels, sills and the rear fenders on the underside in front of the wheels. Floor panels are other common areas for rust through damage, as are the corners of the boot floor, parts of the chassis beam and crossmembers and the boxed section in the front wheel arches. Repair panels are available in abundance, at reasonable prices. 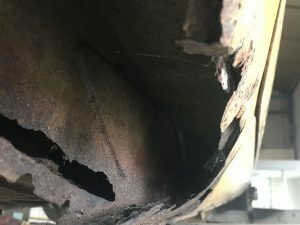 Welding skills and time are a must if you intend to fix a rusty SL. Many SLs are imported from the sunshine states of the US. 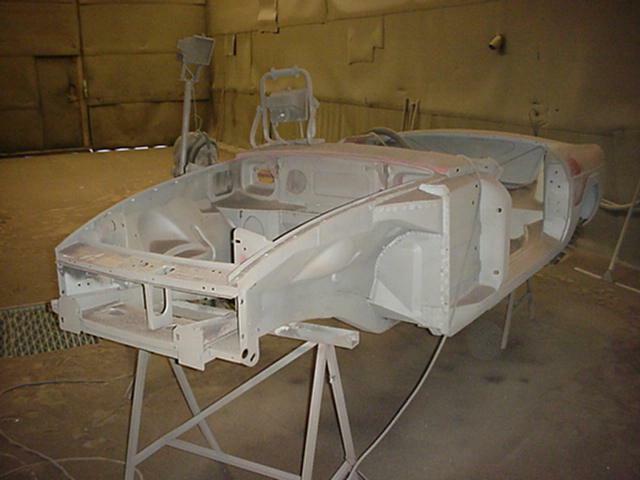 Although a dry climate is good for preserving the bodywork, it is often disastrous for the interior. Typical SL ailments are cracked dashboards (for which repair panels are available), dried out and torn seat upholstery and dried out rubbers. Keep this in mind in the purchase budget and determine whether this outweighs the price of a car with an interior in good condition. 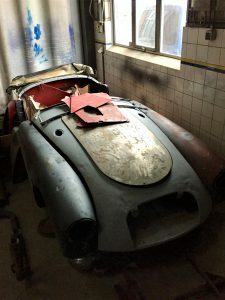 Restoring your own Mercedes R107 SL? Because prices of the R107 have been on the upswing in recent years, it can be interesting for enthusiasts to buy a restoration project. The price difference between project cars and SL's in perfect condition gets bigger every year. If you are not planning to work on a project during weekends and evenings, it is wise to buy the best possible car you can afford, without any cosmetic work or overdue maintenance. When this work has to be outsourced, the costs soon exceed the value of the car, something that does not bother the skilled hobbyist. At Dandy Classics we regularly import Mercedes SL's from the US, both as a restoration project and in a good roadworthy condition. Check out the current offers here. Kurken pakkingen komen veelvuldig voor in klassieke auto's. De toepassing van kurk klinkt misschien als iets ouderwets en achterhaald. Toch is dit natuurproduct een goede oplossing voor het lekvrij afdichten van technische onderdelen. Mits je je houdt aan een aantal basisregels voor montage. Hoe wordt een kurken pakking gemaakt? Kurk is een natuurproduct. Net als fleskurken wordt dit pakkingmateriaal gewonnen uit de schors van de kurkeik. Elke 8-12 jaar kan deze boomschors geoogst worden. Hierna heeft de boom tijd nodig om te herstellen. Aangezien dit proces de boom niet aantast is kurk een milieuvriendelijk materiaal. De meeste kurkproductie vindt plaats in Zuid-Europa, vanwege het gunstige klimaat. Kurk heeft als materiaal uitstekende absorberende eigenschappen. Hierdoor wordt de olie uit de motor door het kurk opgenomen. Dit laat de pakking uitzetten, waardoor een perfecte afdichting ontstaat. Omdat hier wat tijd overheen gaat zal een nieuwe kurken pakking in het begin altijd iets lekken. Met name bij een kleppendeksel of carter moet het materiaal vaak nog wat uitzetten. Een andere eigenschap is dat het kurk oneffenheden prima kan opvullen en afsluiten. Kurken pakkingen zijn dan ook vaak wat dikker dan andere pakkingmaterialen. Kurken pakkingmateriaal kan op rol gekocht worden en dient dan op maat te worden gesneden. 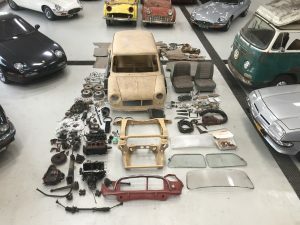 Wij hebben diverse pasvorm pakkingen voor Engelse oldtimers, zoals Triumph, MG en Jaguar. Deze zijn te bestellen in onze webshop. Bij veel Britse klassiekers wordt kurk gebruikt als afdichting in carburateurs. O.a. SU en Zenith carburateurs hebben kurken afdichtingen. Wanneer deze carburateurs gereviseerd worden moeten de kurken pakkingen eerst 24 uur in schone motorolie gelegd worden. Hierdoor zet het materiaal uit en dicht het beter af. Maak allereerst het pasvlak aan beide kanten goed schoon. Een vlak schraapmes komt hierbij goed van pas. Let op dat je geen krassen maakt. Dit vergroot de kans op lekkage. Zorg bij de montage dat de pakking niet klem komt te zitten. Een knik, deuk of scheur betekent dat deze niet meer goed kan afdichten. Bij het aandraaien van bouten moet de kracht gelijkmatig verdeeld worden. Draai bouten of moeren dus stapsgewijs kruislings aan. Gebruik geen vloeibare pakking. Voor veel Engelse sportwagens leveren wij de meest voorkomende pakkingen, o.a. voor kleppendeksels, carters, distributiedeksels en carburateurs. Deze zijn eenvoudig te bestellen in onze webshop. Is de onderdelensituatie voor jouw merk en type auto op z'n zachtst gezegd problematisch? Geen nood, kurken pakkingen kunnen ook zelf nagemaakt worden. De betere automaterialenzaak kan dit pakkingmateriaal op rol leveren. Hiermee kunnen de meest uiteenlopende pakkingen zelf gemaakt worden. Teken het pasvlak af (of gebruik wat vet) en snijd de vorm secuur uit met een scherp mes en lineaal. Voilà, weer een stapje dichterbij een lekvrij motorblok. Geen zin om zelf aan de slag te gaan? In onze werkplaats helpen we graag met het oplossen van lekkages. Op zoek naar een projectauto om te restaureren? Meerdere interessante restauratieobjecten zijn te vinden in onze collectie. Een falend remsysteem is levensgevaarlijk. Vaak wordt er pas ingegrepen na APK afkeur, waarbij lekkage en/of ongelijk remmen aan het licht komen. Een goed onderhouden remsysteem voorkomt problemen. Hoog tijd dus om wat aandacht te besteden aan dit onderwerp. Lekkende of vastzittende remcilinders worden veroorzaakt door vocht in de remvloeistof, wat op den duur leidt tot roestvorming. Ook komt het regelmatig voor dat de rubberen afdichtingen uitgedroogd zijn. Oude remslangen kunnen uitdrogen, of van binnen verstopt gaan zitten. Stalen remleidingen gaan na verloop van tijd roesten en kunnen bij een remrevisie beter preventief worden vervangen door koperen leidingen. Bij constatering van meer van deze problemen is het aan te bevelen om preventief te werk te gaan en het hele remsysteem te reviseren. Voorkomen is beter dan genezen. In de revisie van het hydraulisch systeem gaat veel tijd zitten. Dit kan voorkomen worden door regelmatig de remvloeistof te vervangen. Remvloeistof is hygroscopisch, wat wil zeggen dat het vocht aantrekt. Dit vocht zorgt voor roestvorming aan de metalen onderdelen. Hoe vaak de remolie ververst moet worden is afhankelijk van gebruik en stalling. Regelmatig gebruik in combinatie met vaak vochtige stalling vraagt om jaarlijkse verversing. Bij droge stalling en wat meer recreatief gebruik (weekend en alleen mooi weer) is het voldoende om iedere 2 jaar te verversen. Combineer dit verversen altijd met een uitgebreide visuele inspectie en controleer op lekkage en droogtescheurtjes. Door de stofhoesjes voorzichtig op te lichten kan vaak al gezien worden of er sprake is van beginnende roestvorming. Een defecte hoofdremcilinder bouwt geen druk meer op, of doet dit pas na enkele keren pompen met het rempedaal. Lekkage is vaak al aan de buitenkant zichtbaar. Begin met het demonteren van de cilinder en inspecteer deze op inwendige roestvorming. Lichte oppervlakteroest is prima te verwijderen met uithonen (m.b.v. een hoonapparaat met slijpsteentjes). Diepgelegen putjes zijn met honen niet te verwijderen. Deze zullen ook na revisie blijvend leiden tot lekkage en drukverlies, waardoor de gehele hoofdremcilinder vervangen moet worden. Na het honen wordt de remcilinder weer opgebouwd met een nieuwe revisieset (rubber afdichtingen). Monteer de onderdelen altijd met speciale remcilinderpasta, die te koop is bij de automaterialenzaak. Revisie van de wielremcilinders start met demontage en visuele inspectie. Is de cilinderwand door roestvorming ingevreten dan is dit niet met honen op te lossen. Vervanging van de remcilinders is in dat geval de enige oplossing. Is de roest vooral oppervlakkig dan wordt de cilinderwand licht uitgehoond / gepolijst, totdat het oppervlak weer schoon en glad is. Het principe is vergelijkbaar met de revisie van de hoofdremcilinder. Vergeet ook de hulpkoppelingscilinder niet en controleer de slang op droogtescheurtjes. Bij twijfel altijd vervangen. Natuurlijk kunnen wij in onze werkplaats ook al het nodige werk uitvoeren. Neem contact op voor het maken van een afspraak, met prijsindicatie vooraf. Welke remvloeistof gebruiken in een oldtimer? Ons advies: houd het bij een goede kwaliteit DOT 3 of DOT 4 en ververs minstens één keer per twee jaar. Overweegt u om DOT 5 te gebruiken? Lees dan eerst deze blogpost met onze ervaringen. 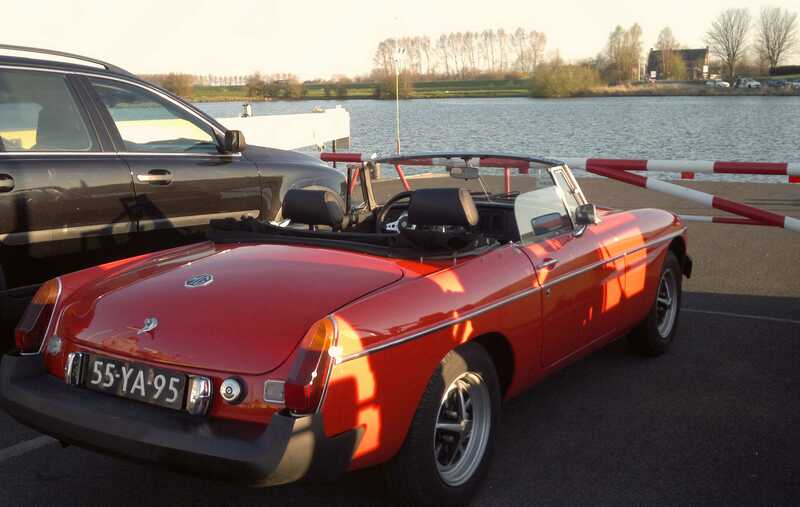 The MGB is still widely regarded as the most popular british sports car. For a good reason, we think. The B combines elegant looks with good driving characteristics, reliability and serviceability. 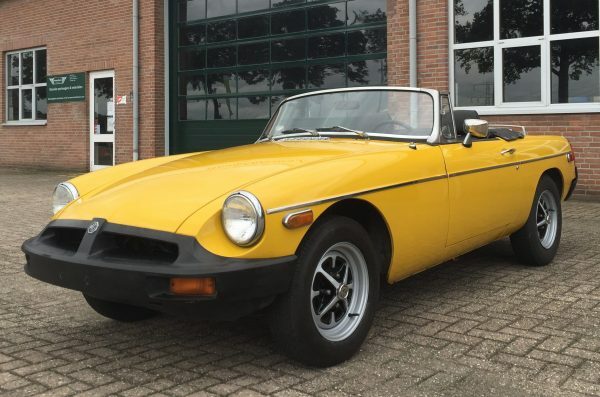 Thanks to its high production numbers, the MGB is still a very affordable classic car. With a production span of nearly 20 years, there are plenty of different versions available. Most distinctive are chrome/rubber bumper cars on one side, and roadsters / GT's on the other. Which car is most suitable really mostly depends on your personal preferences, expectations and budget. The most valuable are early pull door handle roadsters, especially with the desirable overdrive option. These have the most classic look, with their slated grille and metal dashboard. The early cars with their 3 bearing engines are more popular among purists, although the later 5 bearing engines offer improved durability. 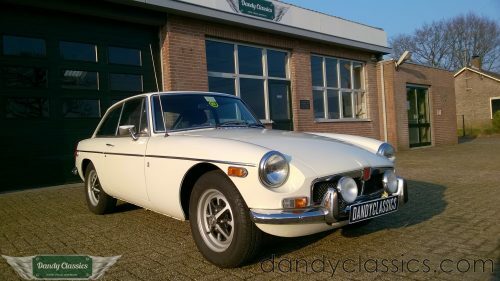 MGB GT's are generally more affordable than roadsters, although the gap is closing. The cheapest cars on the market are RHD rubber bumper project cars. Please bear in mind that the cheapest car will usually turn out to be the most expensive car in the long run. If you decide to take on a project, it would be wiser to invest in an earlier chrome bumper car. Rubber bumper or chrome bumper? This is mostly a matter of taste and budget. Personally, I think the rubber bumpers suit the B pretty well. They are part of automotive history and give the car a distinct seventies look. But there is more to it than looks alone. The rubber bumpers were introduced in 1974, to comply with the stricter US safety regulations. 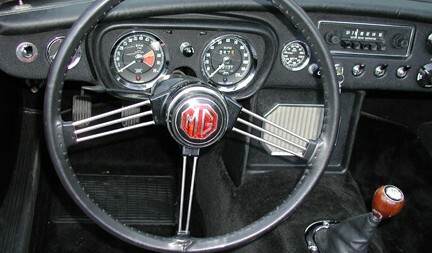 The impact-absorbing bumpers needed to be placed at a certain height, for which the MG engineers had to raise the car a couple of centimetres. Early rubber bumper cars have pretty bad handling, which was improved in 1976, when MG added a front anti-roll bar. 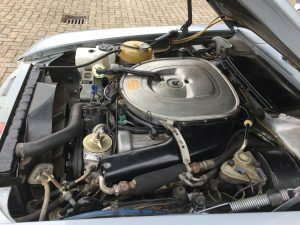 Also, emission standards got stricter and stricter, forcing British Leyland to fit the outdated B-series engine with power-consuming emission equipment. Exhaust fumes were pumped back into the inlet manifold, leading to less polution and less power. 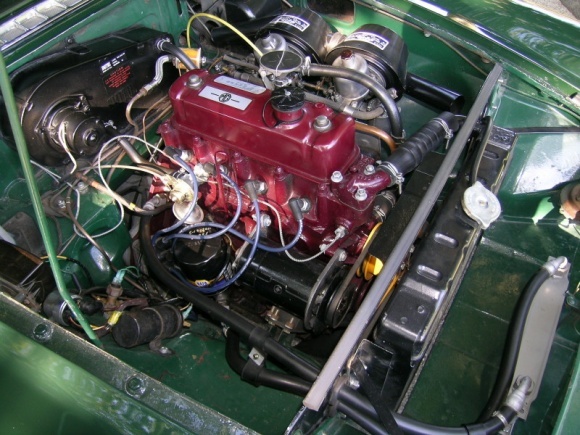 While early MGB engines offer as much as 96 hp, the latest versions are closer to 80 hp. 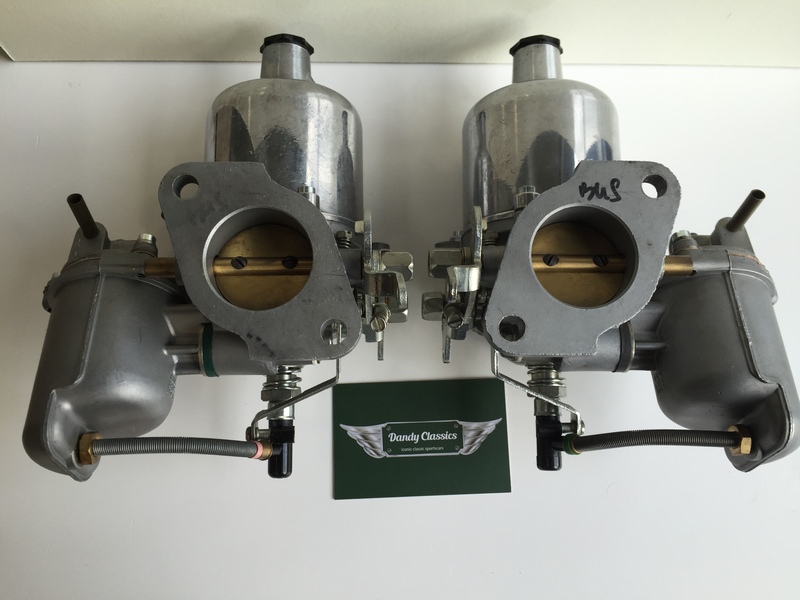 These engines also have smaller valves and lower compression. Removing the emission equipment improves power, but more significant increases are realised by replacing the single Stromberg for a double S.U. or single Weber setup. The rubber bumper cars can be converted to chrome bumper, but this is not very easy, as it involves cutting, welding and (at least partial) refinishing. Most important on your buying inspection is the condition of the unibody structure. Especially the sills are prone to rust, causing a loss of structural integrity on roadsters especially. 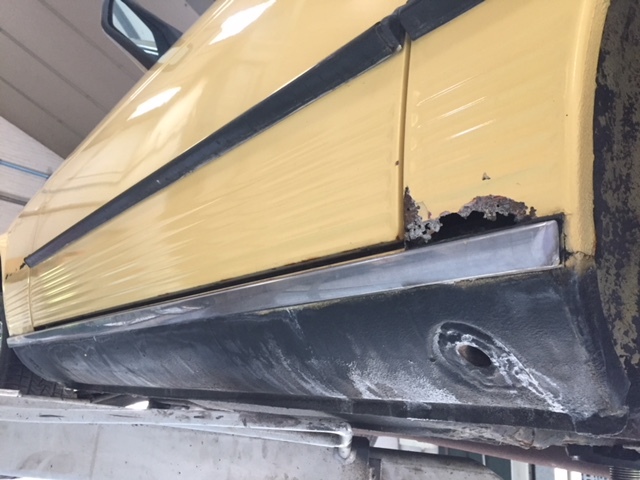 Be aware of signs of body filler, polyester, bad welding and high paint film thickness. Also don't forget to check the inner sills. Other weak areas are the front box section where the front wings are mounted. Front and rear fenders get crunchy at the lower parts, behind the front wheels and before the rear wheels. Roadsters in particular can get rusty floor boards, but replacement panels are inexpensive. Also, the rear wheel arches can be affected by tin worms. 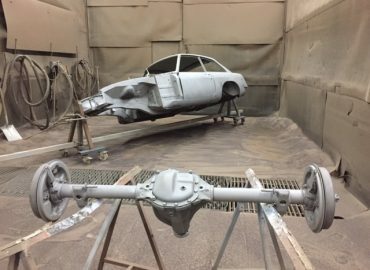 Most MGB's will have had a respray at least once. This is not particularly bad, as long as you are aware that a shiny paint job can hide a lot of misery. Pay close attention to seams, panel fit and, if possible, use a digital film thickness gauge. A magnet can also reveal hidden areas with lots of body filler. MGB's in general have sturdy mechanics and are easy to work on. Focus on the mechanical condition of engine, gearbox and differential, as all the rest is relatively easy and inexpensive to fix. Check the oil pressure on a cold and warm engine, be alert of mechanical noises (the pushrod engines can make a bit of tappet noise, which is unharmful) and if possible, check the compression. 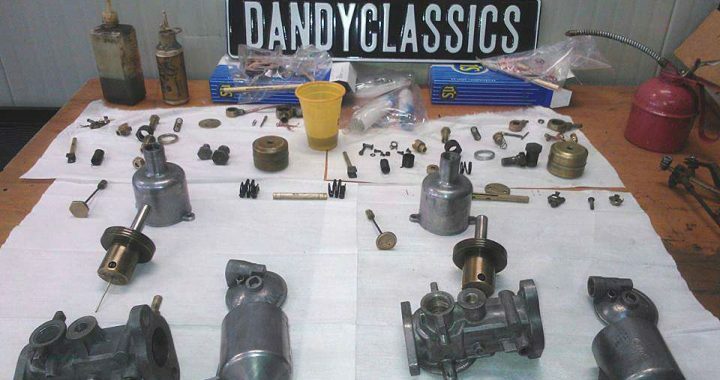 Although MGB gearboxes tend to be durable, they are likely to need a rebuild after 40 years of use and abuse. Check for rattling sychromeshes and noisy bearings. Service and wear parts are readily available and can be ordered directly in our webshop. These classics are relatively easy to restore by a skillful and persistent amateur. 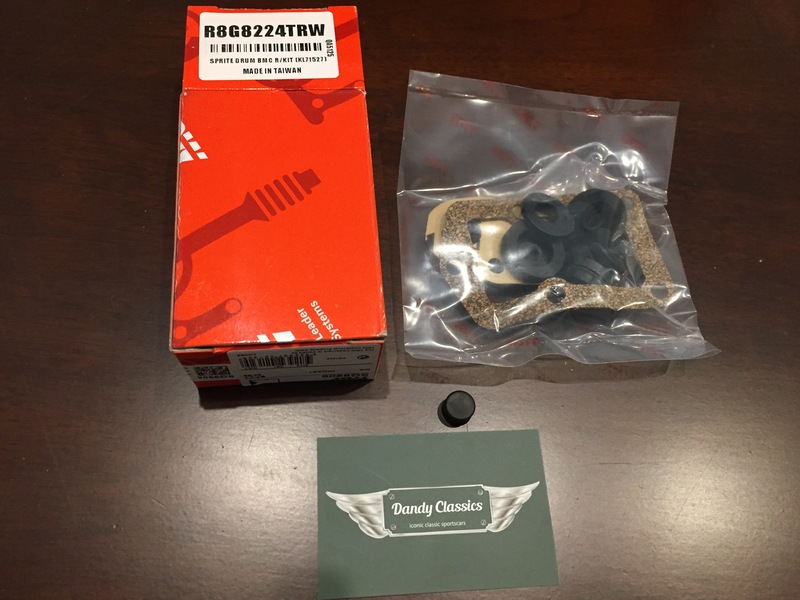 Mechanics are simple and straightforward and parts are easy to source and affordable. 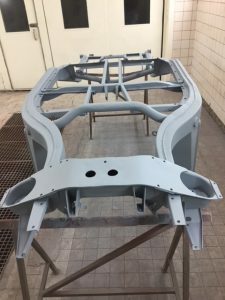 By definition, a restoration involves the complete strip down of a car, building it up with replacing or restoring every single part. The biggest challenge of a restoration is often the unibody structure. As most, if not all, panels can be bought, even the most rusty B can be brought back to as new condition. We always have a number of MGB's in stock. Project cars, as well as good quality drivers. Take a look at our collection to see our actual stock. 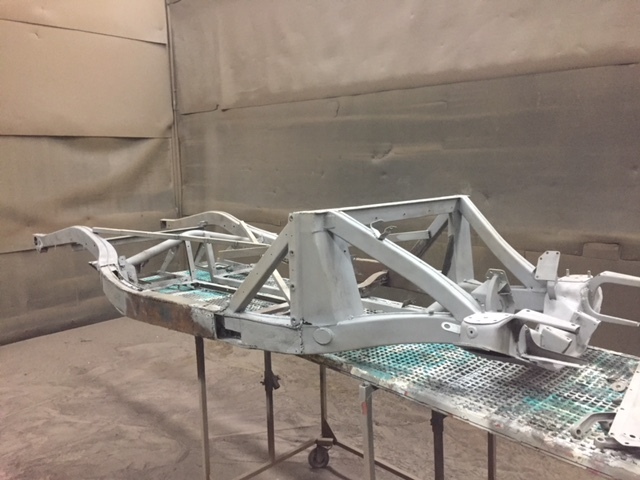 Having started the restoration of our 1960 MGA 1600 roadster, the first step is in restoring the MGA chassis frame. 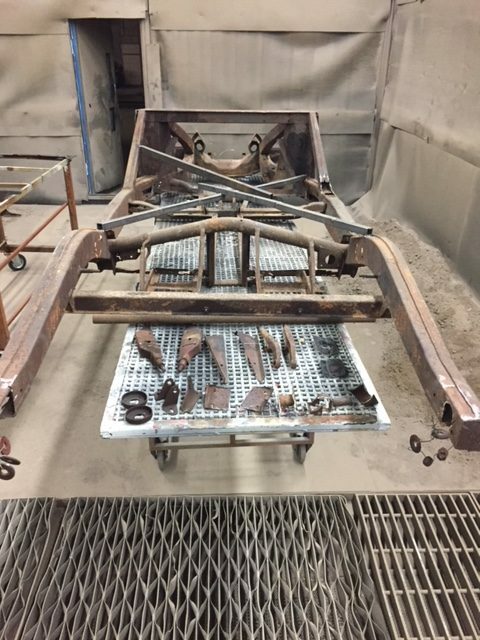 This was quite the challenge, as the chassis had suffered from severe corrosion, and various attempts to keep the rusting metal together. 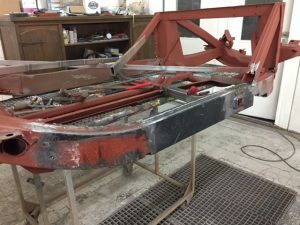 With a methodical approach and some perseverence, we saved this chassis from the scrapheap and turned it back to as-new condition. As this car had already been disassembled by the previous owner, it only required a couple of bolts to be removed. No surprise they had been stuck, after almost 60 years. WD40 and some heat solved the problem. Next, we welded an X-cross in place, using leftover pieces of square steel tubing. 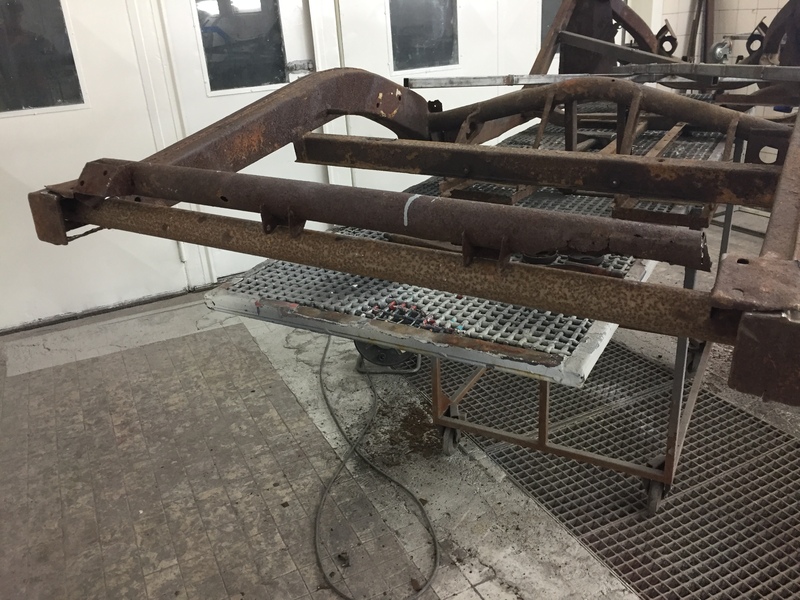 This serves to keep the structural integrity of the frame intact, before removing large sections of the side rails. Of course, before doing all this, we made sure that the frame's dimensions were still intact. Luckily, there was no sign of bending or collision damage. With the strengthening tubes now in place, sections of the frame side rails and the rotten round tube at the rear were cut out. This would allow us to actually clean out the inside of the chassis, as far as we could. 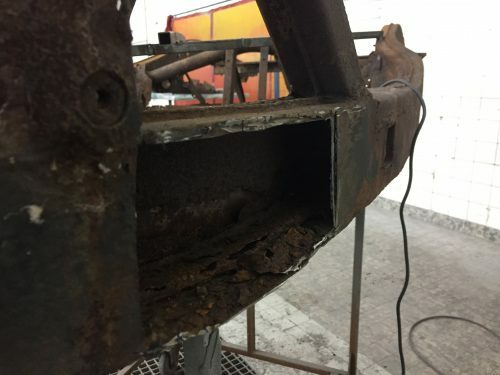 Imagine a rusty piece of metal that is only shot blasted on one side - there will be a risk of further corrosion from the inside, especially when the inside metal is full of rust flakes. 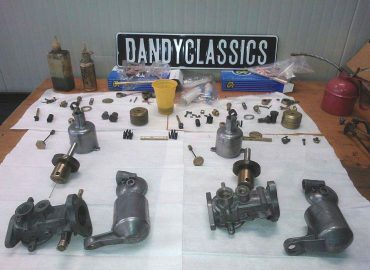 Everything now neatly prepared, it was time to get the MG chassis back to bare and clean metal. As we suspected, a lot of rust flakes came out of the inside of the side rails. 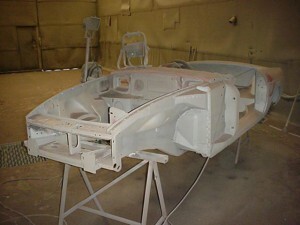 All small bits and pieces belonging to the MGA frame were cleaned as one batch. 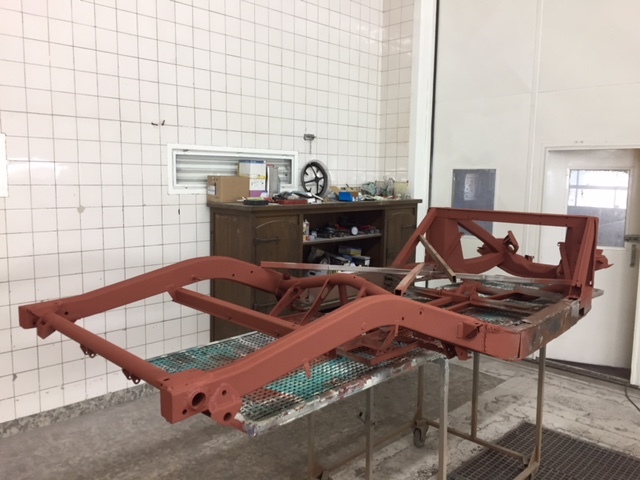 Shortly after the media blasting, we applied a thin coat of red oxide primer (weld-through primer), to prevent the surface from rusting any time soon. Time to turn the solid bits of metal back to a structurally strong MG chassis. We started by removing the square crossmembers and side rails (one side at the time, as to prevent the frame from bending). The crossmembers were fabricated in-house. 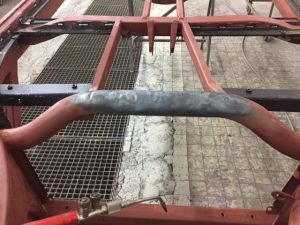 For the side rails, we used reproduction repair pieces, and made the non-available sections ourselves. The round tube at the rear of the frame was replaced from side to side, including repair work to the end of the side rails. 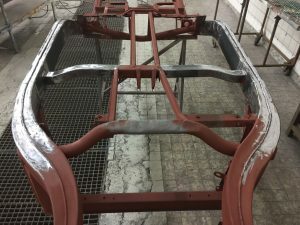 The front round tube had been severely dented, as this is actually the lowest part of an MGA chassis. This was resolved by installing an air valve and slowly heating up the tube, while putting the inside under pressure. Finally, new floorboard rails were welded in place. 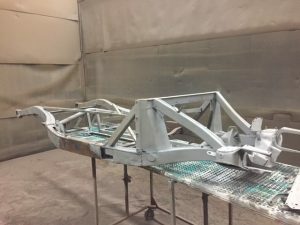 After grinding out the welds, it was time to prepare the chassis for the paint shop. 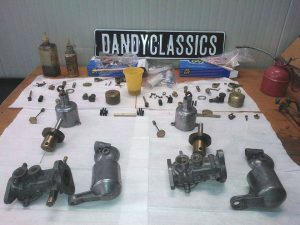 Everything was sanded by hand and thoroughly cleaned. Next, it was sprayed in a protective 2K epoxy primer, after which some of the seams were sealed. 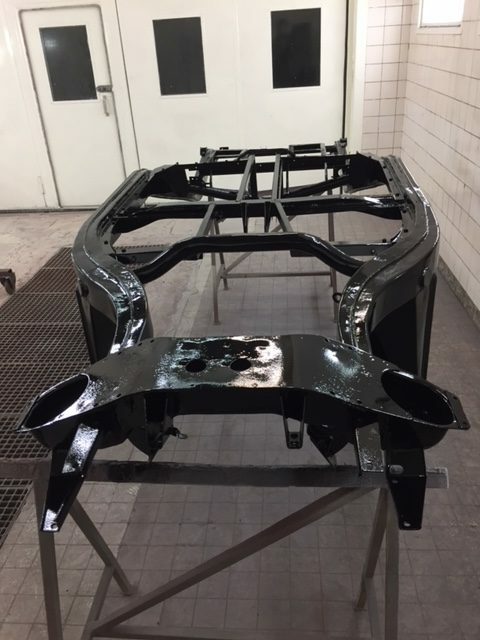 Finally, the frame received a shiny new layer of 2K black paint, with a gloss finish. 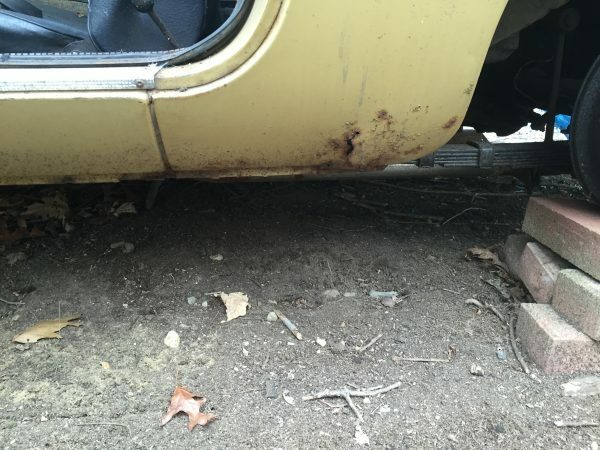 Looking for a project car to restore? 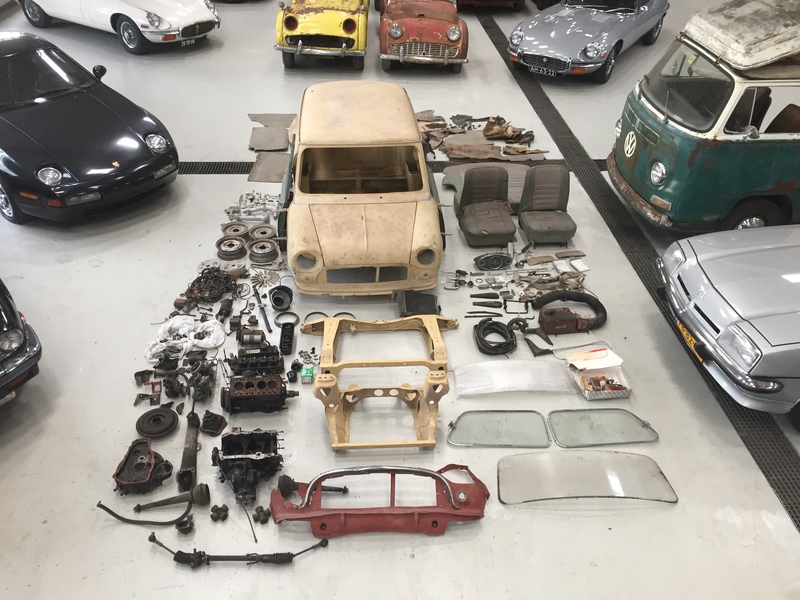 Dandy Classics offers a collection of barn find british sports cars for restoration: MG, Triumph, Jaguar and other makes. 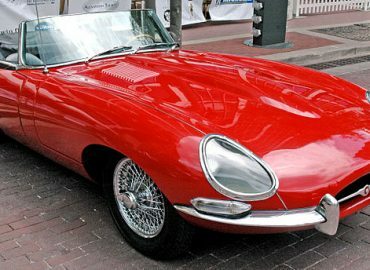 Many of our customers enjoy the process of completely restoring their own dream car, slowly bringing it back to perfect condition. Are you considering to embark on an epic restoration project by yourself? Take a look at our collection of classic cars for sale. 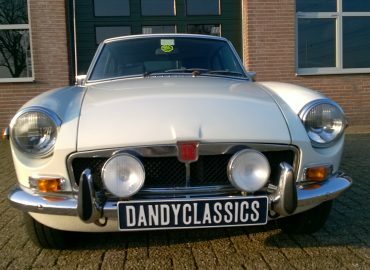 Spare parts for your MG and Triumph sports car can be ordered directly in our webshop. We have our own stock of service parts and offer fast and cost-efficient international shipping. 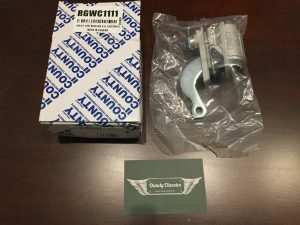 Go to our webshop or contact us with your parts requirements.